Welcome to the autumn edition of Vampir News, designed to keep you informed about the latest developments in our performance analysis environment. 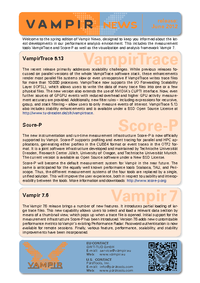 This includes the visualization and analysis framework Vampir and the performance monitors Score-P and VampirTrace. Welcome to the spring edition of Vampir News, designed to keep you informed about the latest developments in our performance analysis environment. 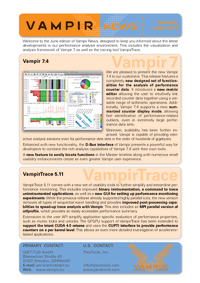 This includes the measurement tools VampirTrace and Score-P as well as the visualization and analysis framework Vampir 7. Welcome to the autumn edition of Vampir News, designed to keep you informed about the latest developments in our performance analysis environment. 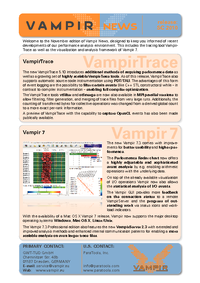 This includes the tracing tool VampirTrace as well as the visualization and analysis framework Vampir 7. Welcome to the June edition of Vampir News, designed to keep you informed about the latest developments in our performance analysis environment. 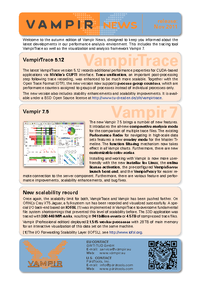 This includes the visualization and analysis framework of Vampir 7 as well as the tracing tool VampirTrace. 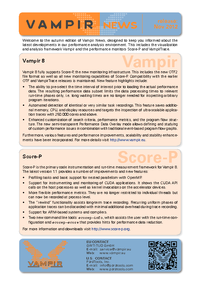 Welcome to the November edition of Vampir News, designed to keep you informed of recent developments of our performance analysis environment. This includes the tracing tool Vampir- Trace as well as the visualization and analysis framework of Vampir 7.